Synapse released a report on Wednesday based on the latest version of its Coal Asset Valuation Tool (CAVT), which shows that the United States could save roughly $262 billion over the next three decades by shutting down a significant portion of its coal plants and replacing them with less expensive alternatives. The report, entitled Forecasting Coal Unit Competitiveness – 2015 Update, demonstrates how a variety of factors, including aging infrastructure, more stringent environmental regulations and lower natural gas prices, are converging to make the majority of coal plants uneconomic. 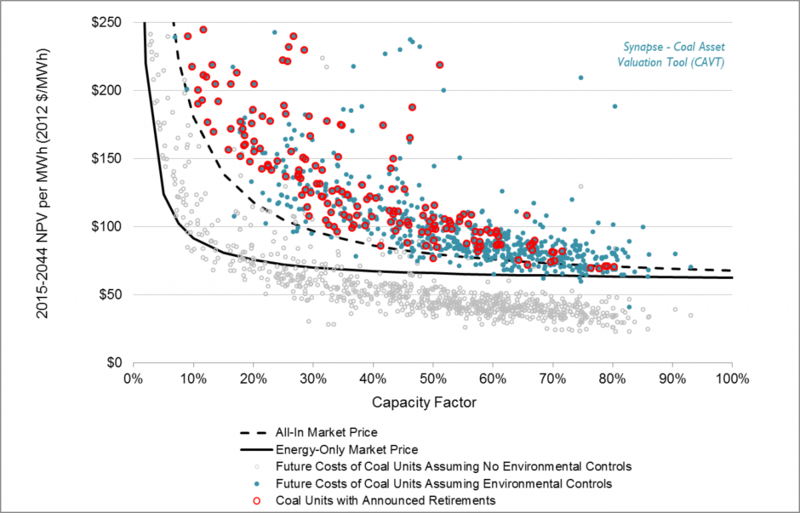 Using its newly updated CAVT, now on version 5.1, Synapse found that 77 percent of coal capacity in the United States (representing 242 gigawatts) is uneconomic and at risk for retirement when compared to the all-in costs of building and operating less expensive, more efficient energy resources. That number leaps to 94 percent (representing 296 gigawatts) when coal costs are compared to wholesale electricity market purchases from existing resources. Projected net present value of coal units assuming environmental retrofits, compared to typical national market electricity prices, 2015-2044. Free and entirely open source, CAVT is a spreadsheet-based database and model that determines the future economic viability of coal units. CAVT forecasts the costs for individual coal units to comply with environmental regulations, adds them to other operating and management costs, and then compares these costs to electricity market prices. “For the most part, compliance costs from environmental regulations and CO2 pricing are absent from the decision-making process. This is a mistake that could prove to be very expensive to electricity consumers over the next few decades as electricity from coal becomes increasingly uneconomic compared to other resources,” noted lead author of the report Pat Knight, who also developed the CAVT tool. The Synapse report provides a general overview using typical national market prices for energy. CAVT is designed to provide more in-depth analysis at local levels, so that decision-makers can assess coal plants on a case-by-case basis. While many other estimates exist for the number of coal plants at risk of retirement as they become financially unviable or reach the end of their expected lifespan, the majority fail to account for many of the costs of environmental compliance and for a long-term carbon emission price. New environmental regulations concerning coal plants—some taking effect as early as 2015—will trigger substantial investments in equipment to reduce pollution from sulfur, mercury, particulate matter (coal dust), nitrogen oxides, and carbon emissions. At the same time, these coal plants are growing older and becoming increasingly inefficient compared to the falling costs of natural gas- and renewable-powered electricity. As a result, many of these coal plants are facing an uneconomic future compared to the alternative of electricity market purchases. In addition to stricter regulations, coal plant operators could very well have to contend with carbon dioxide (CO2) pricing within the next few years. The future of CO2 pricing is difficult to predict, and yet a future CO2 price of some sort is looking increasingly likely. Synapse incorporated its annual CO2 price forecast into CAVT to help electricity planners avoid the financial risks that come with using no CO2 price at all.